Taking — and making — time each month to knit a fabulous new something for yourself or the perfect gift for a loved one. We've had such a mild winter in Wisconsin that I had a different plan for our February project, but then Old Man Winter delivered a snowstorm over the weekend and I realized that my hands are cold and thought yours might be, too. 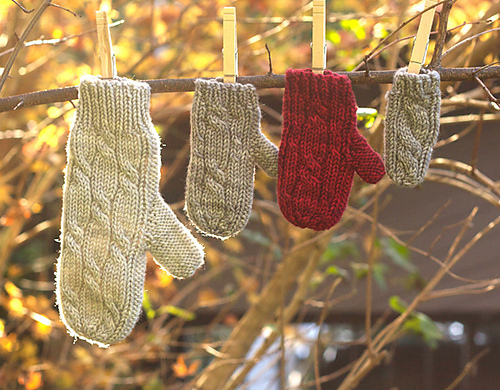 So... this month for the Simple Knits Knitalong, we're going to knit some mittens! To keep in line with some of my fave designers, this month we'll have some fun with Tin Can Knits! Their patterns are so beautiful, well-written and classics that can work for just about anyone. This month I have two options for you because... (1) one mitten is one-size only and the other has a wide size-range, (2) choices are good, and (3) I really just can't make up my mind. 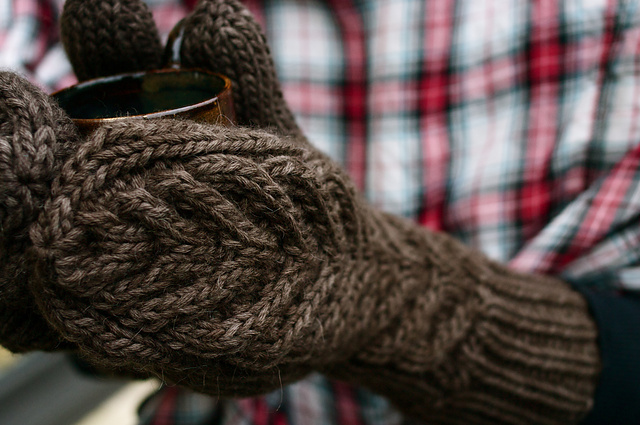 These mittens are luxuriously soft, squishy, and warm. A single distinct cable travels from the generous long cuffs to fingertips. Knit in a gourmet alpaca blend yarn, this project is outrageously satisfying both to knit and to wear! Sizing from Baby-Large Adult makes the Bon Bon Mittens extra versatile for gifting - isn't the wee little version adorable? Both Malabrigo Worsted and Malabrigo Rios are listed as yarn options on the pattern page. Both mittens use a worsted/aran weight yarn, so I'm so I'm sure I'll spend a fair amount of my time at the shop drooling over our options for both mittens - including the Blue Sky and Malabrigo yarns listed in the patterns. Once up my mind, I'll share my selection/s with you and I look forward to seeing what yarn and which mitten pattern you decide on either in person at Firefly Fibers or online in our Ravelry thread! A huge thank you to everyone that's participating in the Simple Knits Knitalong - it's been really fun knitting along with you and seeing your projects pop up on the Ravelry thread! Remember that you can join in on the KAL any time, so even if you didn't participate in January, you can still join the fun! Cheers and Happy Simple Knitting!